Friday, day 4 starts with a 6 mile run along the Forth & Clyde Canal followed by granola and greek yoghurt for breakfast. After breakfast, Billy’s dad Billy takes me into town to get measured for my kilt. Jane had measured me before we left, then re-measured after the kilt hire shop questioned the measurements. They are still not satisfied so we head off so I can be measured in person. Friday morning is a busy time at A1 Kilt Hire of Glasgow. There is a tiny older woman flitting about the shop, seemingly overwhelmed. She keeps moving from one side of the room to the other without actually doing anything. Then there are the two, 20-something Polish girls who are doing all of the work. They are round-faced, friendly, and ruthlessly efficient. One of them takes me off to the side for measurements. She has the kilt and jacket I’ll be wearing. The jacket has one sleeve un-hemmed, as is half of the kilt. Her hands move swiftly pulling the measuring tape up and down my arms and around my waist. Her measurements are exactly the same as Jane’s and I can only conclude that they’re not used to dealing with someone of my height. 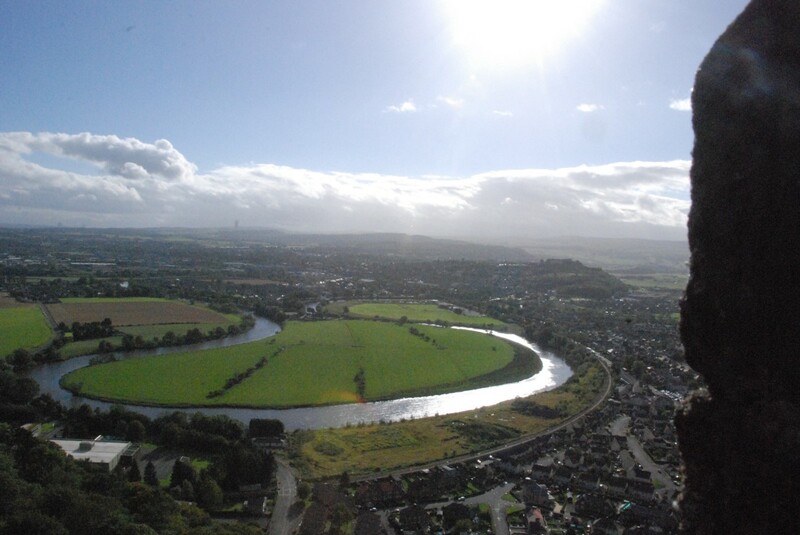 Our morning errands accomplished, we load up into two cars and head off to Stirling for lunch and a visit to the William Wallace Monument. Lunch is at the William Wallace Pub. It’s empty except for a handful of regulars at the bar. Though Jane’s chicken sandwich is uninspired, my fish and chips are quite good. They also have the largest, most flavorful soda-with-lime that I have during our entire visit. Scotland, in the past year, has enacted very strict anti-drink-driving laws. People are very serious about someone being the designated driver for all outings. If you’re not drinking alcohol, the drink of choice is soda-with-lime which is club soda with either a slice of lime or a splash of lime juice. I quickly become addicted to these during the course of the week. I manage to pay for lunch with some difficulty (fending off the hospitality of our hosts and the fact that the pub doesn’t take credit cards) and we head off for the monument. 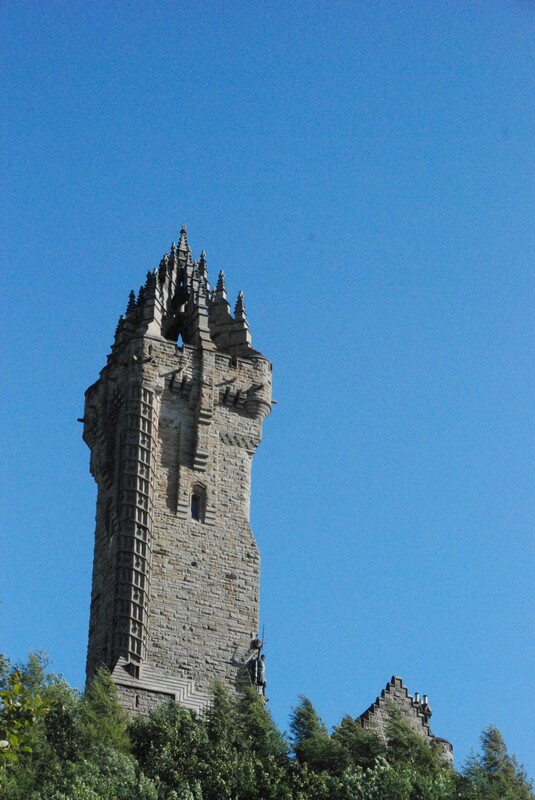 The Wallace Monument is a 220ft (67m) tower built in the late 19th century. 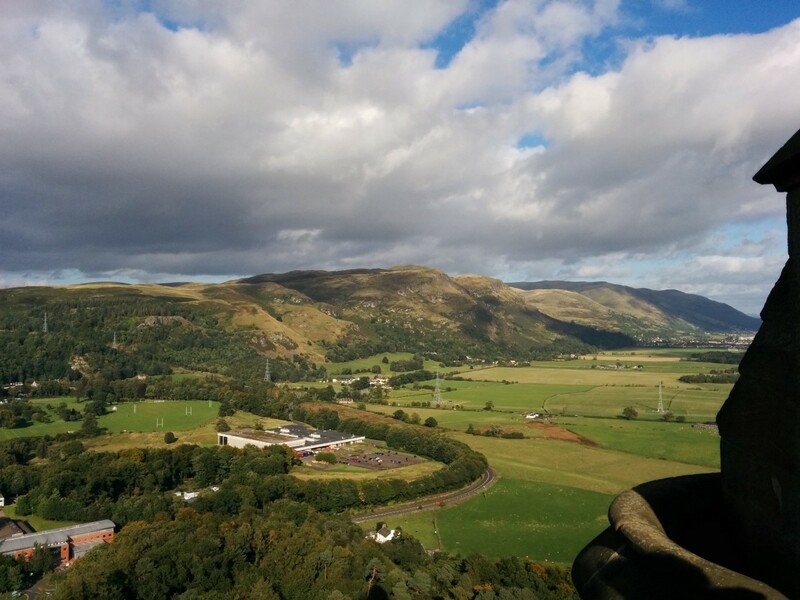 You can climb the 246 steps to the top, stopping in rooms along the way to view William Wallace artifacts and various historical displays. We opt to hike up the short hill to the base of the monument. The wind gets stronger and stronger as we get to the top. Even inside the monument, it tears through the tiny portholes along the stairs. The spiral stairs are so narrow and there are hardly any places to pass if someone else is coming down. That, combined with the fact that my feet don’t really fit on the narrow steps, gives me a constant feeling that I’m about to tumble all the way to the bottom. After a good while, we reach the top. Or at least I think we’ve reached the top. We’re in a walking path in between two walls which are at least 8ft high. There are occasional gaps so you can look out to the distance but they’re narrow so the view isn’t great. Then we round a corner and there’s another set of stairs. These lead to a flat viewing area that is open to the world on all sides. I reach the top of the stairs and stop, stunned. The wind howls all around me and I can see for miles and miles in every direction. It’s so exposed, I almost feel like I’m on the top of a mountain. There are a few clouds but the sun is shining and the air is clear. The view is almost unbelievable. We stay on top for as long as we can stand the cold, then hike back down. There’s a coffee shop in the visitor’s center where we all sit and rest before the drive back to Kirkintilloch. Dinner that night is at a pub called The Kirkie Puffer. This turns out to be my favorite restaurant we visit. Jane’s cousin James finds a little room off the main dining room and claims it for our party (which ends up numbering about 15). James is an amazing host. He shuttles back and forth to the bar getting drinks and appetizers. He watches our for Billy and Helena who are coming separately. All night long, he is on point looking out for everyone. The Kirkie Puffer has a fantastic BBQ/Mexican menu. We have multiple platters of BBQ pork nachos and Jane and I share a BBQ pork burrito for dinner. James’ son Graeme has gotten special permission from the Navy to come home for the weekend and he and his fiancée are there. We haven’t seen Graeme since he was 12 so I’m delighted to see this giant grownup man with Graeme’s face appear in front of me. We chat. We eat. Everyone drinks too much. Jane bests one of the young groomsmen at a beer chugging contest. And that’s how we while away the evening. When it’s time to go home, we walk back with Wee Billy and his groomsmen. Billy tells us hilarious stories of his time working at a public pool as a teenager. It’s dark and quiet as we walk past the church were Billy will be married the next day, past St Ninian’s High School, and then home. Billy and his mates spread a swath of air mattresses across the living room floor. They have bags of crisps and Billy cooks a package of haggis pakora from Costco (kind of like a hush puppy full of haggis). We sit in the living room and snack and watch episodes of Still Game. The boys drink whiskey and Jane and I drink water. It’s peaceful, we’re all tired, but there’s still an undercurrent of excitement for the next day. And that’s how it goes until we can’t stand it anymore and head off to bed.